UPDATE: Fire stabilised 3.30pm Friday. Firefighters are working to extinguish a forest fire at Punta del Capelló near Tivenys. According to the latest reports, 130 hectares have been burned and the fire is not yet under control. 51 vehicles and 16 aircraft are working to tackle the fire which is an inaccessible zone. It began yesterday afternoon. We will update the Ebre Connect Facebook and Twitter accounts with the latest news when we have it. You can follow @bomberscat on Twitter and Local Fire and Weather Watch for this area on Facebook (in English) for more detail. The fire during Thursday night. Below is this morning’s press release from the Generalitat de Catalunya. Els Bombers de la Generalitat, helitransportats ahir en rebre l’avís de l’incendi, han estat treballant durant les darreres hores amb eines manuals per tal d’intentar estabilitzar aquest foc que crema des d’ahir a la tarda a la zona de la Punta del Capelló a Tivenys. Segons les darreres informacions, l’incendi continua actiu. El flanc dret, ha progressat obrint-se cap el Barranc de les Calobres i el flanc esquerre, ha propagat cap a una zona de barrancs pel Mas de Manolo. 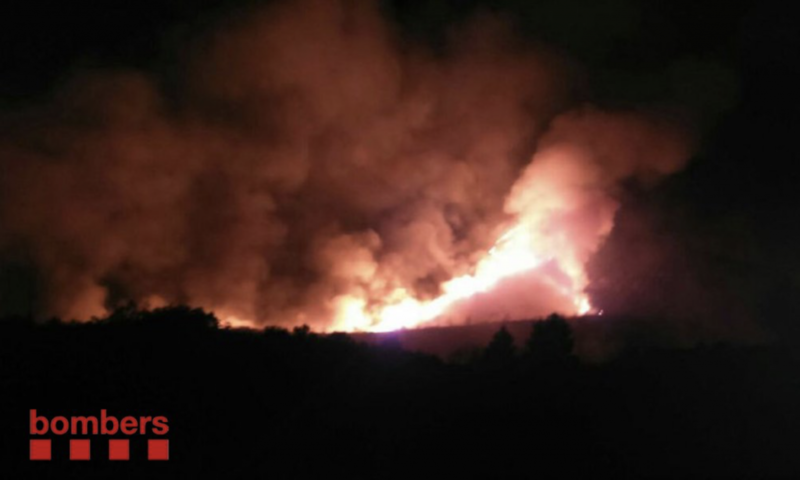 Fins ara, el foc hauria afectat una superfície d’unes 80 hectàrees de vegetació forestal. Al lloc, treballen una quarantena de dotacions terrestres dels Bombers de la Generalitat que, en aquests moments, fan relleu de personal i que, des de primera hora del matí, compten també amb el suport dels mitjans aeris que s’aniran incorporant progressivament. We hope that this has been useful to you. While you’re here, we’ve got a small favour to ask. Hundreds of readers find Ebre Connect interesting and useful, but we need your support to continue. We only publish good quality, accurate copy, overseen by a professional editor. This takes time and hard work to create – and we provide it to you for free. We never copy and paste from other websites. Advertising revenues across the media are plummeting and it’s tough for small, independent enterprises like ours to survive. We do it because we believe in what we’re doing – and we hope you do too. Please consider a donation: if every regular reader donated 15 euros a year we’d be able to look forward to a more secure future. Just click below and use your credit card or PayPal.